Solardome kicked off 2019 in style – by visiting our biggest project ever! The team met with senior teaching staff at The Arbor School Dubai in January to sign off three interlinked 15m Solardome® PROs. The geodesic domes, with a total floor area of 528m2, are set to enhance the new school’s world-class facilities, as they aim to give their students a deeper understanding and hands-on experience of their ecology and environment. The Solardome production team met the challenge head on last year, designing and manufacturing the three domes, as well as completing a frame test build at our Southampton HQ for full quality control – all within short timescales. After completing the manufacture process, we sent six containers, totalling 180ft, containing carefully wrapped components for all three domes on a 4,000-mile journey from Southampton to Dubai. The Arbor School hired a local construction firm who were joined by Solardome’s Project Manager Paul Hackett for the colossal build in November. All three geodesic domes, complete with interlinking tunnels, double doors and finished internals, were assembled within 60 days. 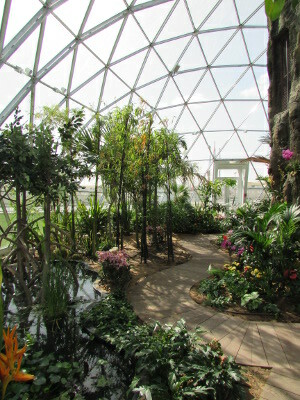 To truly maximise the space for first-class learning experiences, each dome will provide different functions: one as a tropical ecosystem, one as a green playscape, and the other as an ecological makerspace. “These structures help us go back to traditional values like reading a book under a tree, picking fruit from a bush and growing your own avocados,” he added. 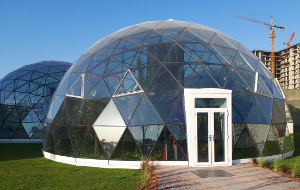 Solardome’s Managing Director Pippa Bailey and Operations Manager Gary Mitchell flew out to see the domes, and were blown away by the way they had been imaginatively finished inside. Find out more about Solardome. Find out more about The Arbor School.